MANSFIELD — Mid-Ohio Educational Service Center recognized 16 senior students from client school districts for their academic success, school and community service at its annual Franklin B. Walter Scholarship Award Dinner on March 21. Seven students were awarded $500 scholarships based on their school grades, test scores, activities and an essay detailing the positive impact of one educator on their lives. All students read their tributes aloud and introduced their “Positive Impact Person” to the audience of over 100 people; which included family members and school administrators. Winners of the $500 scholarships made possible by Mid-Ohio ESC Board of Governors was awarded to: Kade Slagle, Bucyrus City Schools; Alicia McElwee, Cardington-Lincoln Schools, and Claire Korbas, Shelby City Schools. Additional $500.00 scholarships were donated by Avita, Ohio Health, Milliron Industries and Startek. Awarded winners were: Emily Kanney, Plymouth-Shiloh Local Schools; Tara Andrews, Madison Local Schools, Carlee Secrist, Lexington Local Schools, and Olivia Vick, Ontario Local Schools. Others honored as Franklin B. Walter Scholarship Award nominees included Sadie Kurtzman, Pioneer Career and Technology Center; Lane Fry, Crestview Local Schools; Keagen Sqrow, Crestline Exempted Village Schools; Sophia Thompson, Highland Local Schools; Elizabeth Yirga, Lucas Local Schools; Luke Eisnaugle, Galion City Schools; Taylor Niese, Buckeye Central Local Schools; Keeley Weese, Mansfield City Schools; and Caitlin Thebeault, Northmor Local Schools. To honor former State Superintendent Dr. Franklin B. Walter, the Ohio Educational Service Center Association (OESCA) established the Franklin B. Walter All-Scholastic Awards to promote student achievement and recognize academic accomplishment. One student from each of Ohio’s 88 counties will be honored at a ceremony in April in Columbus. Shelby City Schools senior Claire Korbas will represent Richland County. Cardington Lincoln Local Schools senior Alicia McElwee will represent Morrow County. 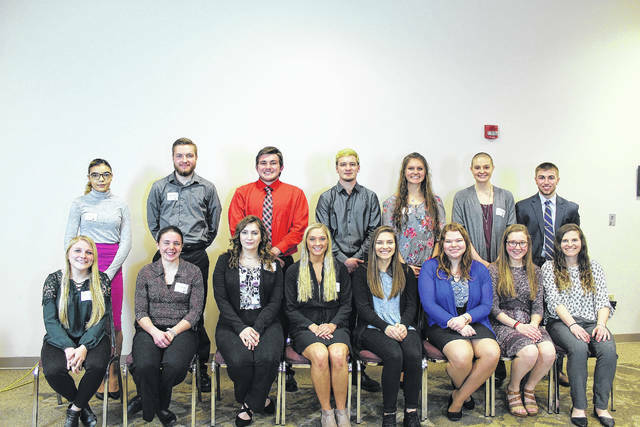 Courtesy photo Mid-Ohio Educational Service Center recognized 16 senior students from client school districts for their academic success, school and community service at its annual Franklin B. Walter Scholarship Award Dinner on March 21.
https://www.galioninquirer.com/wp-content/uploads/sites/38/2018/03/web1_IMG_2436-FranklinBWalterhonorees.jpgCourtesy photo Mid-Ohio Educational Service Center recognized 16 senior students from client school districts for their academic success, school and community service at its annual Franklin B. Walter Scholarship Award Dinner on March 21.